Third party logistic (3PL) solutions in Mexico enable any company selling B2C products to bypass tariffs and duties in America while sustaining the same shipping experience as if their products were shipped from California. 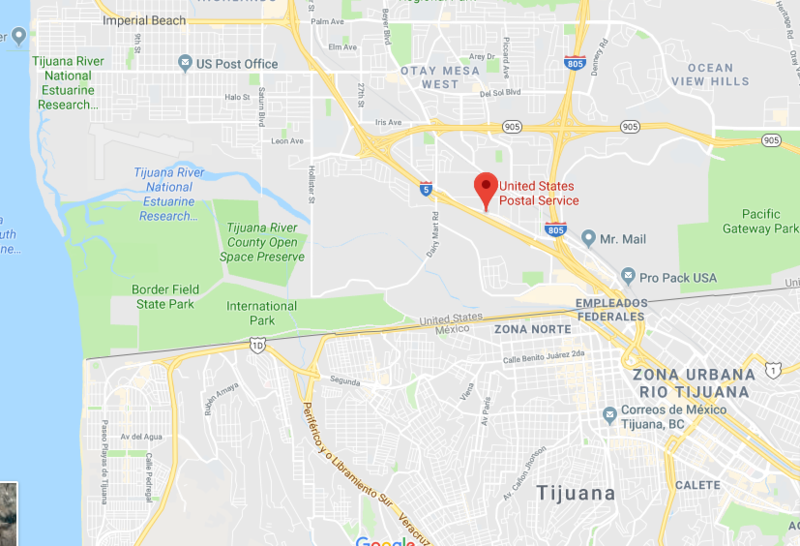 Located just 20 miles south of San Diego, the city of Tijuana has become a vibrant logistics hub for the ecommerce and retail industry. What makes this place special are the warehousing costs, labor rates, and laws that enable organizations to avoid duties and tariffs. In a third party logistics company, the main costs revolve around warehousing plus pick and pack fees. Compared to America, warehouses in Tijuana are over 53% more affordable and labor rates are 76% less. Running the numbers, it makes sense why an ecommerce brand or retail group that shifts it’s third party logistics to Mexico is able to save a significant amount while maintaining the same (or better) ship times. Avoiding duties and tariffs is just one of the added benefits. Before we dive into the actual third party logistic costs in Tijuana, you’re probably wondering how using a third party logistics company in Mexico will enable a company to avoid duties and tariffs (in both America and Mexico). There are two very important laws to understand that will enable your business to become duty free. One is the IMMEX program in Mexico and the other is Section 321. Utilizing both laws, your company won’t have to pay duties in America or in Mexico, even if your products are imported through America to Mexico. Let’s first explore how you can avoid duties in America. There are two key components here, as most people who handle their warehousing and fulfillment in Mexico think they have to import their products through a Mexican port. Using bonded warehouses and containers, you can actually still import your products into any American port (most common is Long Beach) and truck them down to Mexico without paying duties. To avoid paying duties in America, your products will be exported to Mexico under the IMMEX program. The IMMEX program stems from the creation of Mexico’s maquiladora industry. This industry was established in 1964 to enhance employment along the border of Mexico and America. With the implementation of the North American Free Trade Agreement (NAFTA) in 1994, the Maquiladora Program was altered to work with companies investing in Mexico for its labor, proximity to America, and low costs. 3PL companies under the IMMEX program are able to import products into Mexico to be warehoused duty and VAT free. From a bird’s eye view, you’ll import your products just as you normally would, but keep them in a customs bonded warehouse to be sent into Mexico. 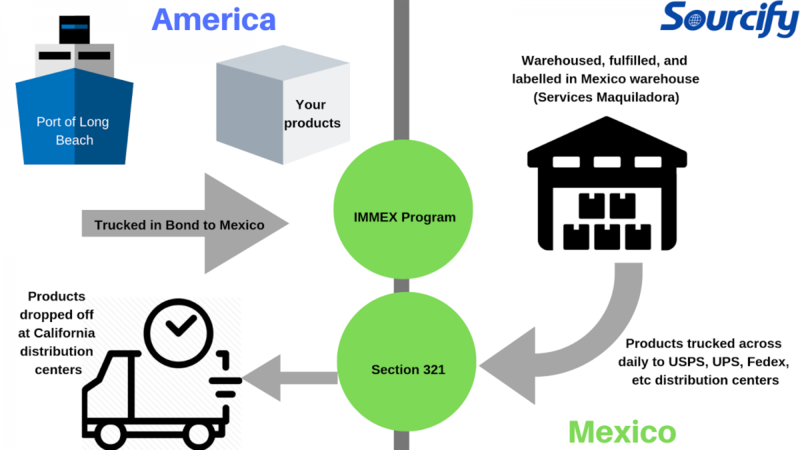 Your products then enter Mexico under the IMMEX program, duty free. A fulfillment warehouse with a services Maquiladora receives your products and stores them until they are ready to be fulfilled. Your customers aren’t based in Mexico though and you now need to get your products back into America. This is where we’ll utilize Section 321 to import your products back to America from Mexico, duty free. Section 321 of the Trade Facilitation and Trade Enforcement Act states that goods with a declared value under $800 can be imported into America duty free. This law follows The De Minimis value threshold, which is the maximum monetary value of a shipment that can be imported into America duty and tax free. Though Section 321 has been around for over a decade, it’s just recently become more actively used for ecommerce companies. In the ecommerce world, most dropshipping companies ship products through e-packets. The millions of yearly shipments primarily from Asia to America pass through customs under Section 321. For ecommerce companies that aren’t dropshipping, most currently work with domestic third party logistics providers and haven’t realized the benefits they can receive if they are importing in bulk and warehousing their products in Mexico. Unlike a traditional providers where you pay duties upon unloading your goods, the 3PL companies in Mexico label each package individually to your end customer, ensuring each product that crosses the border is under the $800 threshold of Section 321. When your products are warehoused, picked and packed, and labeled in a fulfillment center in Mexico, each item is distributed into America individually, meaning the declared value of each item is under $800 (even though they may all be put in a large truck together). Your customers then receive your shipment as if your product was fulfilled from San Diego or another city close to a Mexican border like El Paso. These trucks crossing the border daily with these shipments stop at the distribution centers of USPS, Fedex, DHL, and UPS right across the border. For any ecommerce company, avoiding tariffs and duties would be a game changer when it comes to increasing margins and improving operational efficiencies. Even for B2B brands or distribution centers, you’re able to better manage your cash flow by offsetting duty costs. Instead of paying duties when your products are imported into America at once, you could pay duties on a rolling basis as your products are imported into America from Mexico on an as needed basis. Let’s now look at the actual numbers and why you should use a third party logistics company in Mexico even if you aren’t avoiding tariffs. The benefits of working with a third party logistics company in Mexico doesn’t just stem from avoiding duties and tariffs. From an operational standpoint, these companies like Baja Fulfillment and XB Logistics are also much more affordable and efficient, while maintaining the same ship times as American based third party logistic centers. 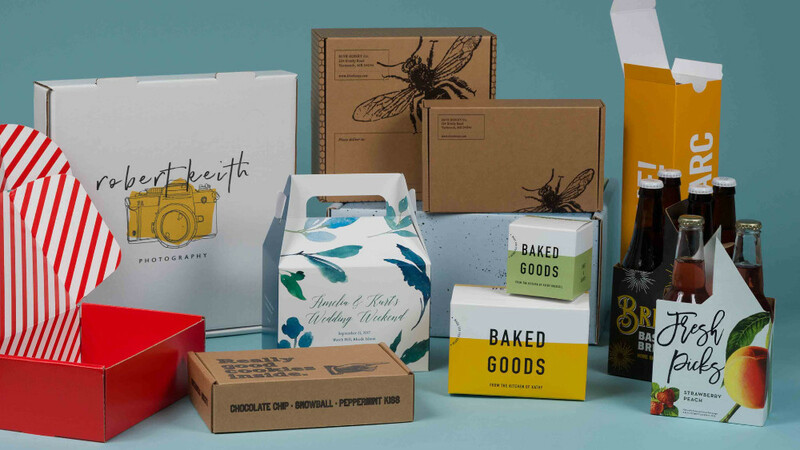 Pick and Pack fee: The price for a provider to pick a product from storage and pack it. The more units you ship each month, the cheaper this fee should be. Warehousing cost: Usually a monthly fee based on the amount of space used. Often charged per pallet. Receiving cost: What your partner will charge for offloading products from your transportation provider and into their warehouse. Shipping cost: The actual shipping cost to deliver a product to your end customer. 3PLs often have better shipping rates because they ship at scale. Account setup fee: The price you pay to create an account and integrate software. For the most part, these are pretty fair costs and most third party logistics companies in America are competitive. In Mexico, where on average, labor rates are 73% lower and warehouses cost 50% less, you’re guaranteed to have more competitive options. Companies like JC Penny or Taylor Guitars that handle their logistics in Mexico are able to have much better margins than your average brand based on their Mexico centered fulfillment strategy. The savings you see on third party logistics, plus the avoidance of duties could equal a cost savings of over 70% in your logistics costs. The money you save all depends on the HTS codes of your products and the volume of shipments you make every month. Tariff cost: HTS code 6401.10.00 of 37.5%. 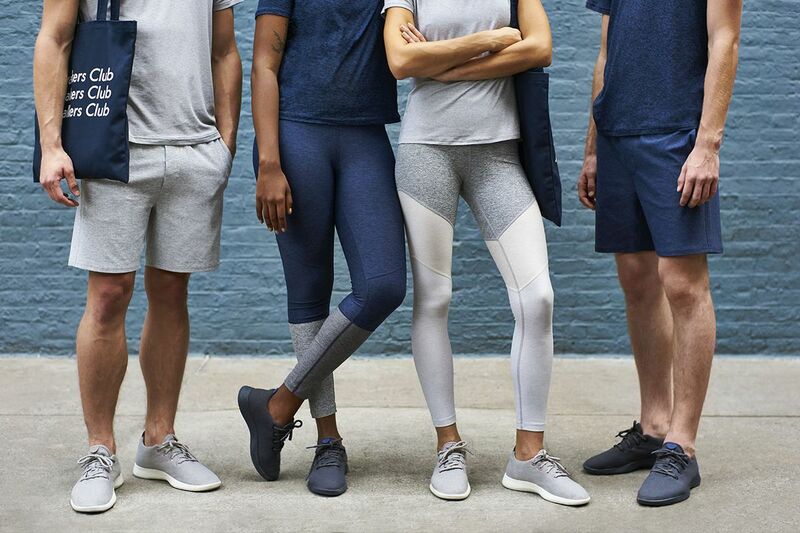 Let’s say their footwear costs $25 each to produce and they are importing 10,000 units a month, totaling a declared value of $250,000. 37.5% * $250,000 = $93,750. Company A is paying $93,750 in tariffs for every importation they make. Tariff cost: HTS code 4202.12.20 of 20%. Let’s say their bags cost an average of $60 per unit to produce and they are importing 100,000 units a month, totaling a declared value of $6,000,000. 20% * $6,000,000 = $1,200,000. Company B is paying $1.2 million in tariffs for every importation they make. This could be wiped off Company A and B’s expenses by handling logistics in Mexico. It should be obvious that transitioning your fulfillment to Mexico will enable you to save a massive amount of money while maintaining the same ship times you offer your customers in America. What most question is the security in Mexico. Tijuana is one of the most vibrant parts of Mexico and has grown substantially over the past few years. For many that are well traveled, it’s very similar to other developing cities. Though it does get some press for being a dangerous area, most of those stories stem from people searching for trouble. In terms of political stability, we should first look at the origins of the Maquiladora Program, which was established in 1964 and transitioned in 1994 to fit the North American Free Trade Agreement (NAFTA). These agreements were put into place decades ago and aren’t changing anytime soon. Even with the current Trump administration, it’s near impossible for the president alone to change NAFTA as any transition would need to be passed by Congress. Section 321 is also here to stay and the de minimis value was actually raised from $200 to $800 in February of 2016. This is what enables your company to import products into America duty free. With these high volume, low value shipments, the U.S. Customs and Border Protection has worked towards a number of automated enhancements using their Automated Commercial Environment system. For me personally, I love going down to Mexico for good food, great fishing, and relaxing beaches. The added bonus of a major cost savings opportunity is what makes this area even better. The beauty of this whole operational setup is the ease of access both online and offline. If you’re looking to visit a third party logistics company in Tijuana, simply fly into San Diego and drive 20 minutes south. You’ll then be in Mexico where you don’t need a visa and can set up meetings with the top providers in the area. Online, just like any modern third party logistics provider, the company you work with should have a system in place that syncs up with your ecommerce platform (like Shopify or BigCommerce) and enables you to see inventory levels, shipment statuses, and tracking numbers. 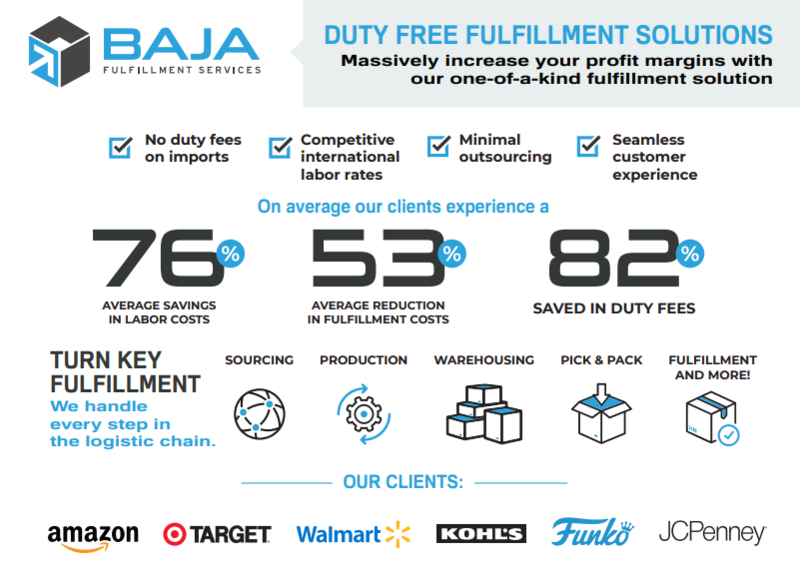 After over a hundred hours of research and five trips to Mexico just to see a few operations like Baja Fulfillment, I can now confirm the ability to save money in your supply chain in Mexico is real. This primarily stems from the affordable labor and warehousing in these border regions like Tijuana. The icing on top is the fact that you can avoid tariffs and duties when fulfilling your products out of Mexico with the same shipping experience as if your products are shipped from California. I’ve seen small seven figure ecommerce operations and large fortune 100 companies like Sony and Panasonic use Mexico for its affordable labor and close proximity to America. If you’re looking to increase margins in your supply chain, look no further. Your solution is in Mexico! How does the cost to import products from Asia directly into Mexico compare with the cost to import into the USA?